This work exemplifies the power of fusion between art and architecture in a project that conveys purpose and emotion and creates a place of reflection, serenity and significance for its nation. 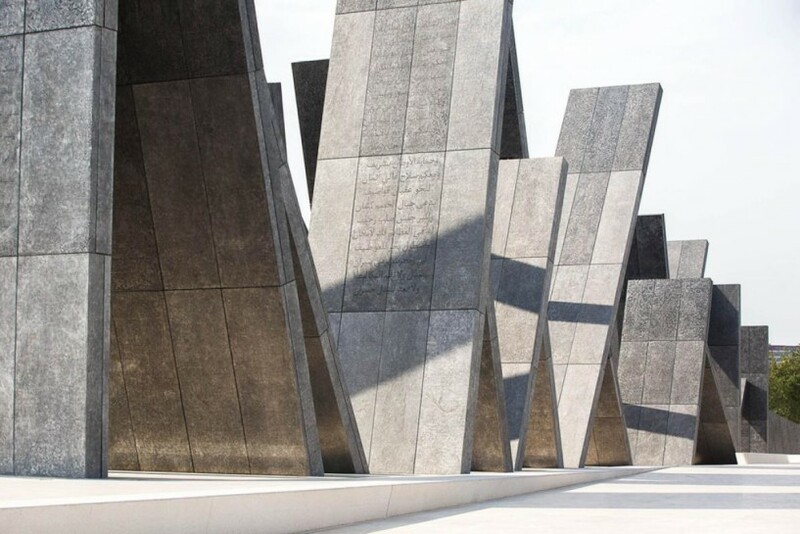 At the heart of Wahat Al Karama park is the MONUMENT which serves as a unifying poetic moment despite its monumentality. The complex structure is comprised of 31 aluminium vertical tablets, the largest soaring 23 metres in height. The tablets appear to gently rest on each other symbolizing the united strength of the seven nations of the UAE. It features Arabic poems and quotes from both the late Sheikh Zayed Bin Sultan Al Nahyan and Sheikh Mohamed Bin Zayed Al Nahyan and entice the viewer to read, reflect and touch the artwork, creating a personal relationship with the Memorial. heroes. As a collaboration of artist, curator and architect it is a built expression of the artists practice and the aspirations of the region for its heroes.